A light East wind was forecast, but for much of the match the surface of this strip lake was almost flat calm, and it was warm to begin with, then very hot when the cloud moved away. Before the match Nigel Baxter, who was fishing the Tuesday Open on Beastie, and knows the lakes as well as anyone, told me I would probably need a swim at the far end to win. I fancied 15 in the corner, but would have been exceeding happy to get anywhere from 11 to 20. So 24 was not ideal, but the fish in Yew are big, and anything could happen. This is what greeted us - oh for a nice ripple! 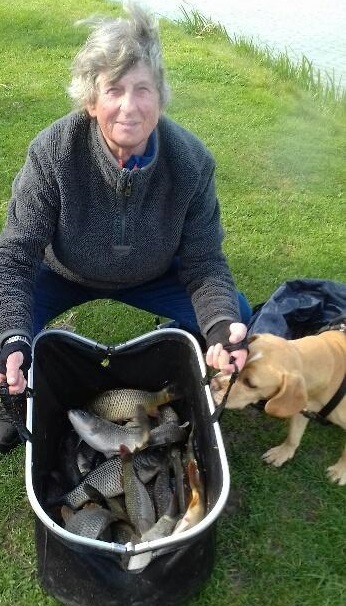 I made a mistake not getting my feeder rod out of its bag, but after I had driven to the lake and started to get my tackle out of the car I needed to go to the toilet, so that put me a little behind – but it’s no excuse. Seventeen of us fished. I started by putting a bait-dropper of dead maggots at top two at the bottom of the shelf, and started at 9 metres on pellet. It was a nasty, glary day, and I had to put my sunglasses on to see the float properly. After a few minutes, and a few liners from fish swimming just under the surface, I got what looked like a proper bite, hooked a fish, but it quickly came off, probably foulhooked. After half an hour I went onto the maggot over the loose feed, fully expecting barbel, but never had a touch. Martin Parker, on my right, found occasional big fish in the deep margins. So it was back out on the pellet, then half an hour shallow, then back on the maggot, and after two hours I had not had a fish! Peter Harrison, to my left, had had two or three on a Method, and Martin Parker to my right had had a 10 lb carp four sections out. Then I saw him fishing close in to the reeds and catch a fish, but he looked to be fishing five feet deep. Which was the depth of my maggot swim, where I had not had a bite. 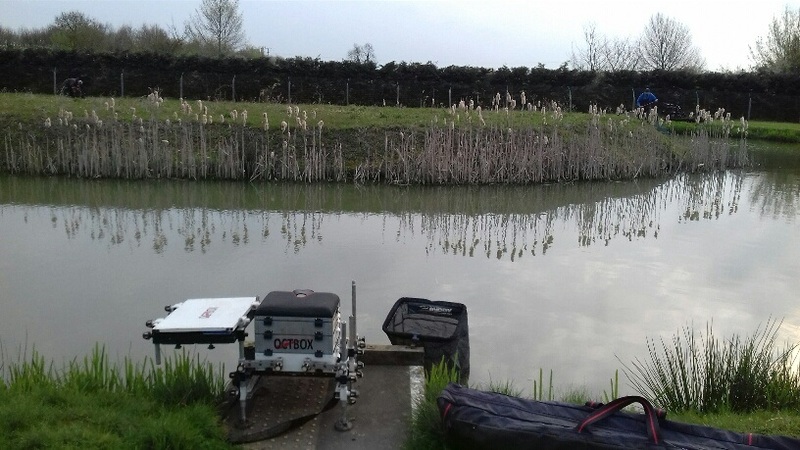 Eventually I decided to get out the feeder rod, but first I decided to try something which felt ridiculous at the time – cat meat in four feet right beside the reeds. I hadn’t fed anything, so more in hope than expectation I dropped in on top two to my left...and within a minute I had a tearaway bite which I assumed was from a barbel. In fact it was a 10 lb-plus carp, which eventually finished up in my landing net. of fish caught by everyone. 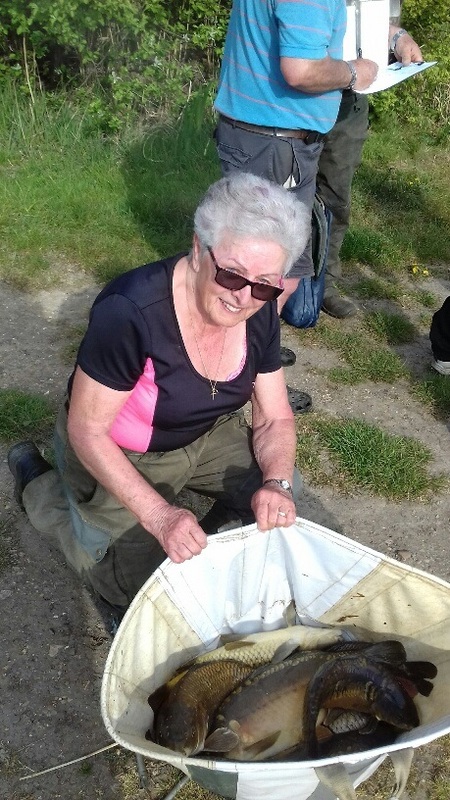 the biggest fish - estimated at around 13 lb. 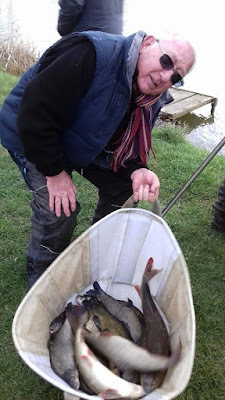 For the next two hours I stuck to cat meat close in, but managed only about one bite every 20 minutes; however, three more were 10 lb, and three F1s and a barbel also obliged. Peter, to my left, was now taking fish steadily, about every 15 minutes, and was clearly beating me by miles. Martin, on my right, also seemed to be hooking fish more quickly than me, but I think some may have got off. Then the wind (what there was of it) turned round briefly to the North which brought a tiny amount of ripple, but from 2.20 pm to about 3.15 I went biteless, and in desperation was just about to get my feeder rod out of the bag again when I had another try just past where I had been fishing in my right margin. 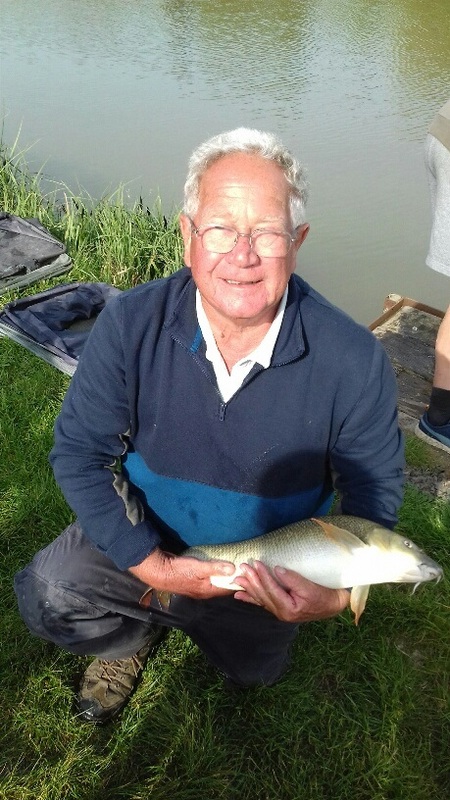 Immediately this produced a barbel on corn, and then another double-figure carp on corn, followed by yet another – a 12 lb common – and a near-5 lb barbel, both on cat meat. Then the match ended. All day long small fry were hitting the float and the line in the margins (but not farther out), and smashing into the bait as it was sinking. If I had corn on the hook they wiggled it all over the place, which was why I eventually tried cat meat. This they still attacked, but they were so small they couldn’t damage it much. In retrospect I should probably have tried two pieces. Once I put on a big dendra expecting barbel, but fry were grabbing the end and pulling it about, and I soon gave that up. Concentration as Peter and Trevor do the honours. I estimated I had 80 lb, and in fact weighed 87 lb 1 oz for fifth place. Peter Harrison to my left was second with 126 lb 6 oz, with one fish taken on the waggler and the rest on the Method on banded pellet and then sweetcorn. Some came casting the feeder into the near margins towards the neighbouring platforms. 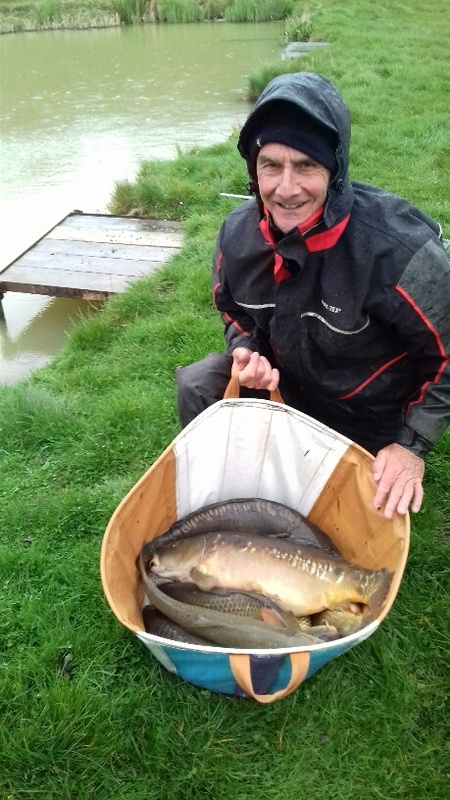 Winner was Trevor Cousins on 13, who took his fish in both margins on pole – three sections to the left in four feet of water, and top two to the right in two feet, using corn and cat meat (not together!) - after spending the first 45 minutes on the waggler trying to catch the fish which were showing on the surface all over the lake. 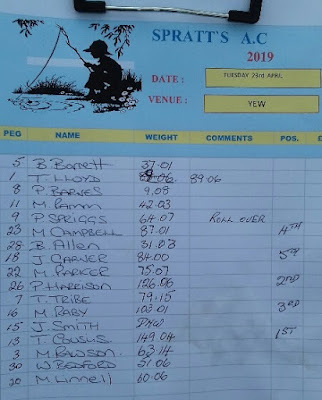 On Peg 15 in the corner, a swim which has been fishing really well, John Smith had a terrible match, catching his first fish at 2,30 pm, then not getting another bite until 3.45 pm, when he took four fish in the last 15 minutes. He was very dis-chuffed and went home without weighing in, to put the kettle on so I could join him for a cup of tea when I had finished. 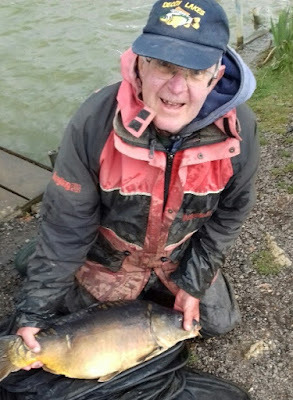 Mike Rawson on 3 didn’t get a bite until 1.30 pm, then put a feeder down into the margins and ended with 63 lb 14 oz. Meanwhile 91-year-old Ted Lloyd had two fish beside the reeds on peg 1 early on which he said weighed at least 20 lb between them, soon added another couple of smaller ones, but couldn’t keep them coming that fast – however he ended fourth with 89 lb 6 oz. Man of the Match? The result - better than we expected after the first two hours. Ted - 91 and still catching them! in the last two-and-a-half hours. I enjoyed fishing in the sun, for a change, and will have to make some adjustments to my plans now – a cool bag for the cat meat for a start. I certainly should have tried the feeder, and the special paste I have made up, to see whether it deterred the fry; but all round I was happy to beat Martin on my right. I lost only two foulhooked fish all day, and landed a couple that were foulhooked, including one of the barbel, which was hooked in the nose and played me for a long, long time! I realised after I was home that the sheet was marked wrongly, as Ted was fourth, I was fifth and John Garner sixth. Next match Sunday on Six-Island, when the wind is likely to determine which swims fish best, then Monday on Elm. I don’t mind where I get pegged here. Wendy's first match with the club. One thing – now that the ground is firm I find the Frenzee trolley much easier to push than it has been this Winter. Hopefully it will help me to keep competing for another year or two. It was also good to be able to wear just shoes rather than heavy thermal boots and Goretex bib and brace, which together make walking much more difficult. Scraping the ice off the car windscreen is not the best way to start, and it meant a cool start for the 12 of us in this Spratts club match, with the forecast North-Easterly from my right. I drew peg 7, and had intended to start on a small Method, but I decided to try out my three main pole lines and keep an eye on the others, most of whom started on a feeder. I like to make sure the rigs seem right and everything is working, early in the match. So it was out to 10 metres with a 1gm Tuff-Eye (I like these because you can change the colour of the tips) and a pellet. But ten minutes saw no indication so I had a look in the swim in front of me, after putting in dead maggots. Treble maggot bait tempted half a dozen roach, so I had a look in the margin to my left. Top two plus one took me to the edge of the next platform, 8, which was vacant. At this moment I looked round to see Trevor on peg 11 playing a good fish on a waggler rod, and not long after, Rob on 9 hit a good fish on cat meat in his margin, which seemed deeper than mine. lot of the squashing you get with nets. 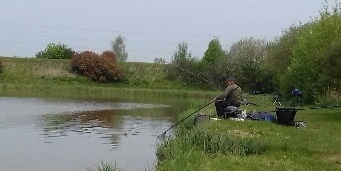 After a few minutes a 2 lb bream took my corn, and then a 3 lb carp, though now Trevor was playing his third big fish. He had a back-ish wind, ideal for the waggler, and I guessed the rest of us were already fishing for second place. 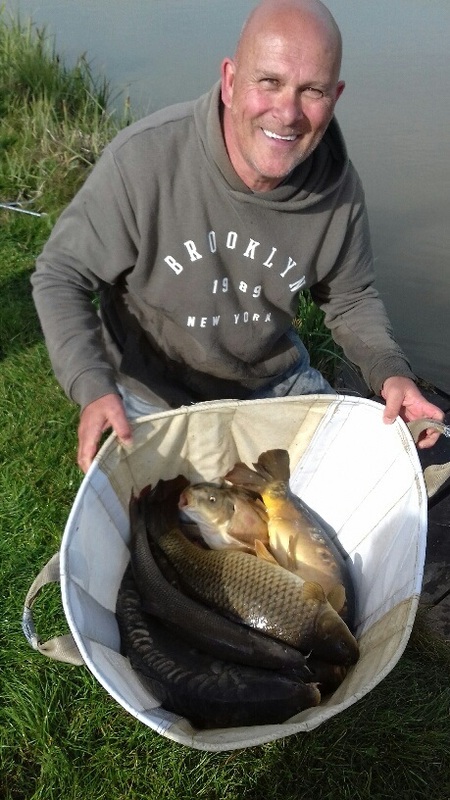 Corn took a couple of F1s, and then a switch to cat meat brought fish of around 9 lb and 7 lb and another F1. When bites tailed off I had another look at the third pole swim, on top two plus one in front of me, changing to corn, using a 0.5 gm Tuff Eye and hit a succession of F1s to almost 4 lb on corn. The bait had to be just touching bottom and moving, to get a bite. Mick, on my right, seemed to be struggling, and although Rob had had another fish or two I was sure I was now well ahead of him. Yet again I had to change elastics in my front swim twice during the match, from an 8 up to Grey Hydro and then to Preston 13 Hollo, as the fish threatened to charge through Mike's swim to my right. My best fish was about 9 lb, on cat meat. 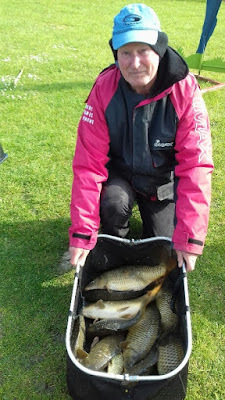 The rest of the match was spent switching between the two close-in swims, and I found that feeding with a small pole pot as I lowered the bait often brought a bite. If I hadn’t had a bite within a minute in the swim in front of me I brought the rig back, put six grains of corn in the pot and went out again. At times the fish gave bites which looked as if they were from roach but in fact I hooked only one roach, so I am sure the F1s were playing with the bait. The wind died in the middle of the match before picking up again, and in that time I had my best spell, and included two or three proper 4 lb carp. The fish in the left margin responded to cat meat, and they gave a bite within seconds; any longer than that and I had to lift the rig and drop it in again. Trevor had a lot of 5 lb-plus fish, to win. With an hour and a quarter to go, and my clicker showing 38 lb in each net I went for a third. As always when I returned I couldn’t pick up where I had left off, but that constant feeding with corn in front of me started the F1s feeding again. I kept wondering whether I should go to the left margin, against the next platform, with cat meat again, hoping for bigger fish, but I decided to keep putting fish in the net. In the event I doubt whether I would have caught Trevor. I put 22 lb 13 oz into the last net (just over an hour) and finished with 98 lb 12 oz for second, almost 40 lb behind Trevor, who fished Wafters on a waggler about 18 inches deep, casting right across to the far bank and totalled 137 lb for the win. I lost just two fish, one definitely foulhooked and the other almost certainly so. 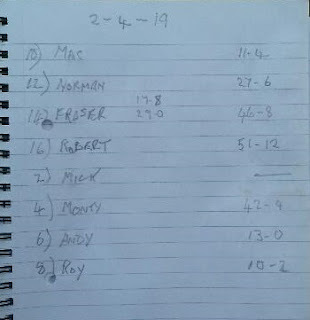 So all-in-all I was quite happy, beating the anglers either side, which is always the first aim. The icing on the cake was help with getting my tackle back to the car, and then help putting it in the back of the car – my back was really playing me up. 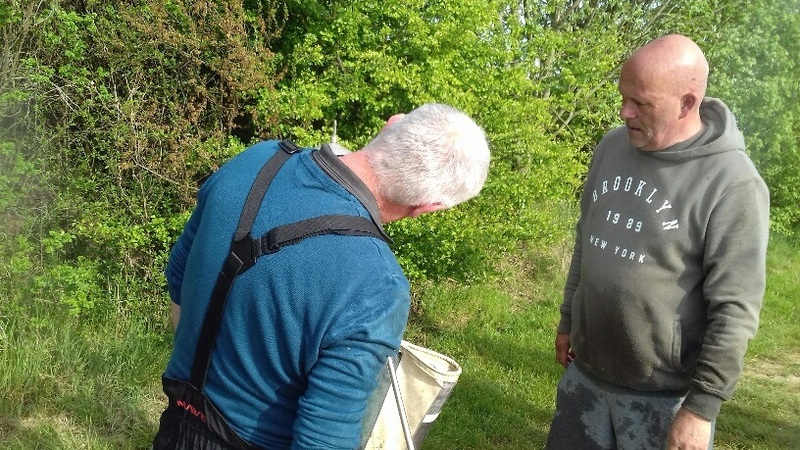 That’s the great thing about fishing – help is always available and freely given. They are my mates and that’s what mates are for! 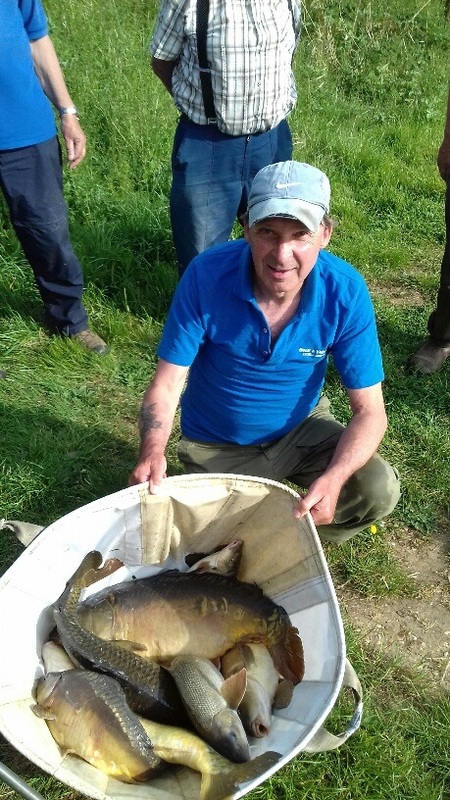 Martin Parker's best fish, around 13 lb. The result - better than I had expected after the overnight frost. After the now-usual trip to the toilet at the end, I was able to watch most of the weighing-in; pegs 1 to 5 were difficult, and surprisingly those from 13 onwards didn’t produce the big weights I had expected. 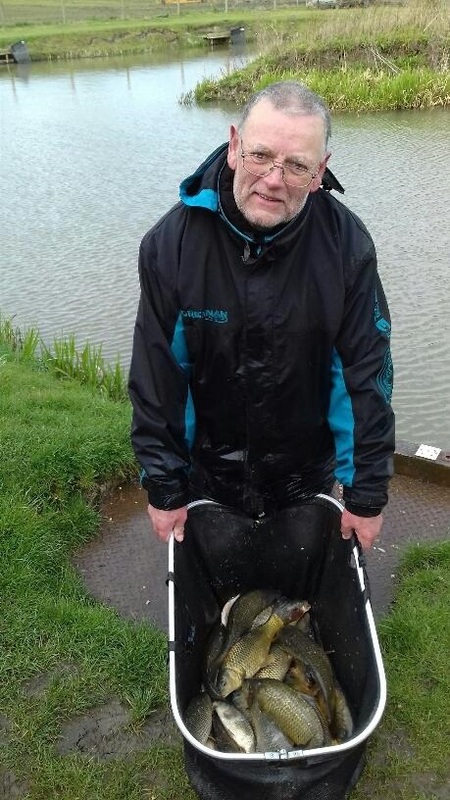 Best fish was about 13 lb to Martin Parker, former Vets National Champion. 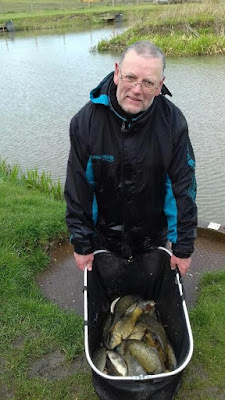 It helped him claim the golden coin from Terry Tribe, former Div 4 National Champion, who struggled on peg 3. It's amazing that Martin does so well, as he has only one eye! 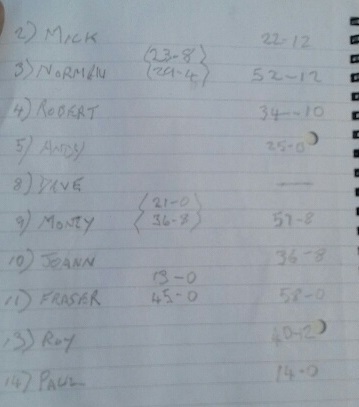 Peter Harrison on 13 was Golden Peg, so it’s a roll-over to our next match the week after next, on Yew. A strong North-Easterly soon enveloped my nice-looking swim. I couldn’t resist starting with bread over towards the far-bank reeds, at only about 11 metres, though I plumbed up a swim on a top two, another one half a section further out where it was 18 inches deeper, and the left margin which was about two feet deep. The sun was in my eyes when I looked to the right, so that margin swim would be difficult for the first half of the match. The wind was in my face, from the left, which meant that to fish the left margin I would have to be facing the wind – not easy as it affected the presentation. think he, like me, used mainly corn. First drop-in over to the far bank with bread, and a 3 lb common came in. Second try, and a big fish was hooked, which stretched my 13 Hollo elastic so far I couldn’t believe it – the fish went almost down to The Vicar, who was two pegs away on 5. 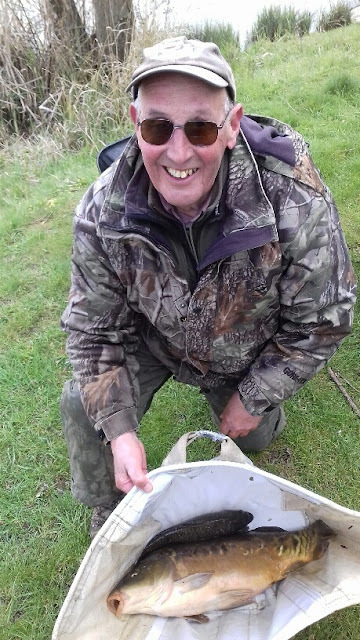 It turned out to be a near- 5lb mirrror foulhooked in the side, but I eventually persuaded it to dive into my landing net. Next cast produced a 2 lb common – 10 lb in the first half-hour. But then only roach took the bread, and most of them dropped off. I’d put a bait dropper of dead maggot in the deepest swim, and a pot of pellets in the top-two swim, but now had to abandon the far bank, and have a quick look in the margin with corn. First drop-in and a 2 lb common took the corn; but it took me another 45 minutes to get the next couple. The top-two swim produced one bite and a 6 oz bar of soap, while the longer swim produced just one tiny knock. So it was back to the margin, and a quick drop-in on top two to the right margin, almost next to my keepnet, produced a 3 lb common, but no more. After a long lull I tried the right margin about six metres along, and hooked a fish first drop-in, which came off. Obviously the flashings of those fish were spooking any others that may have been around. Lake by 8 oz with this 58 lb catch. 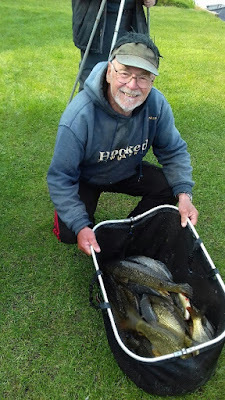 The angler to my right, Tony Carr, was taking occasional fish to 4 lb on a long pole in his right margin, slightly round the corner so he was a little less handicapped by the sun than I had been. Like me he kept having to change swims after hooking a fish. I managed one more on bread across, and he went across and promptly foulhooked three in three casts, all of which came off. runner-up on Mark's, beaten by 8 oz. weight on Mark's than Emily's. But where did that dog come from? I finished with a few more in the last couple of hours from the left swim, and then one more five minutes before the end. I dropped back, expecting another bite – which I got! But I missed it, and within seconds the match ended. While Tony seemed to be fishing within inches of the reeds I had to go about four feet out, where the water was slightly deeper, to get a bite. At one point I put on a worm, but had no takers. The fish seemed to want the bait lifted slightly – the majority of the margin fish took like that. And after the sun had moved I tried the near right margin again, without any sign of fish. I need to go to Specsavers! I didn’t check my clicker, and after I had packed up I told Tony I thought he had 40 lb and I had about 25 lb. In fact he weighed 38 lb 4 oz, for the lake win, and I weighed 34 lb 8 oz – one more 3 lb fish would have won me the lake. was happy with my performance. I’m on Six-Island at Decoy on Friday, and have no preferences at to where I draw – it all depends on the wind direction. It’s forecast for a continued strong ENE, so pegs 4 to 9 and 24 and 25 would give a back wind, which will suit me. I expect I will get 10 to 15, facing it! Actually I would particularly like peg 17, no matter what direction the wind is in, but have drawn it only once, when I won. It's in a gap between the island and a corner, and offers lots of options. It's not on Six-Island, it's on Horseshoe, and I have no preference as to where to draw, though it will be head wind on 1 to 8. Nice margins all round this lake. Fourteen of us fished this Fenland Rods club match, with rain forecast most of the afternoon, which was correct. 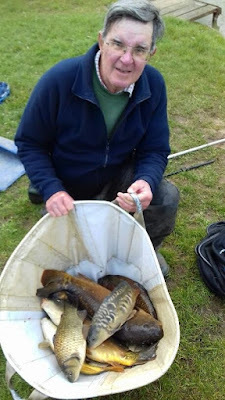 The water was well coloured on my peg 15 and since the margin banks were bare I decided to target the barbel close in, at the base of the shelf, only about four feet out. I have found that where there are reeds or sedge growing in the water the barbel have not undercut the bank, and that these swims are better for carp because they are not heavily populated with barbel. My margins were bare, where barbel have undercut the bank, causing it to fall in. So I put in maggot on one side at top two length, and corn to the left at top three length where I managed to find a flat piece of bottom; although I expected barbel, I obviously would prefer the carp, and corn can help to pick them out. I started, however, at four sections and immediately had liners. Coming off bottom brought not even liners, so I went down again and took about three carp to 6 lb. When they seemed to go I went to the right margin with maggot and eventually managed to find barbel to 3 lb. But after about three they also went. a thrashing in the rain, taking good carp. So to the left margin, where I caught three carp and a barbel on corn in four put-ins on corn; but then nothing. So out to four sections with 6mm expander, and another couple of carp. I spent all day moving round, though I never had another fish from the left. To my right Kevin Lee was catching the occasional carp on cat meat about seven feet from the bank, and I could see that they were probably averaging 5 lb, while my fish were much smaller. 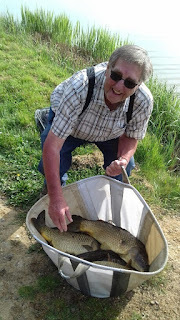 I found two or three barbel on worm and another, and a carp, on cat meat from the right margin, but I knew I had been beaten by Kevin, and probably by John Smith on my left, who had been taking fish at nine metres. Ten minutes from the end Kevin landed a fish of about 9 lb, and I saw him started to wind his rigs onto a winder; so I guessed he had filled both nets. There obviously wasn’t time for him to get another. Meanwhile on the peg opposite me I saw Callum Judge take several late carp on a feeder fished just feet from his near bank. 30 lb - a good average size for early April. fish on 6mm expander pellet. I thought afterwards I should have concentrated on the four-section swim in front of me, or even gone farther out, as we had a backish wind at our end of the lake. I never had a really good spell, which was surprising as I am sure there were barbel there all day. 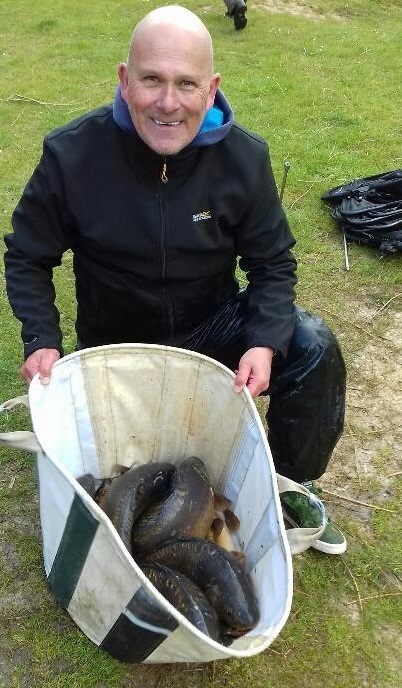 Four barbel took me right under the bank, so far that the shot were pulled up the line almost to the float, but I got them all out – pretty hair-raising at the time, and it was a miracle they didn’t snag me permanently. 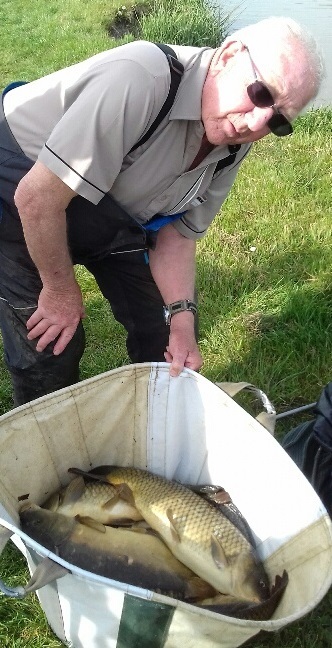 One barbel took me under the platform and broke me and I lost one carp, coming back with a scale, and I was pleased that I didn’t lose any more. Kevin lost some – probably foulhooked, and several anglers told me that they had the same problem. The result - the angler on 24 was The Invisible Man! My fish weighed 75 lb 4 oz for fifth, with Tony Nisbet top with 111 lb 3 oz of mainly carp on 6mm expander, mainly from a margin swim against a clump of reeds. 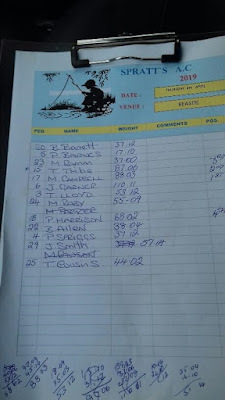 Kevin was, as I suspected, over in both of his nets, and would have won – his official weight, though, was 100 lb for fourth; John was second, giving him a good start in the Club Championship race. 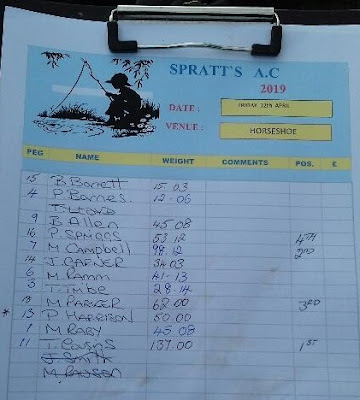 We have a new points system for the club this season – 15 points for a win no matter how few fish, down to 1 with anybody fishing guaranteed at least 1. Every match counts, and I know I have to miss some matches, so I guess that will put me out of the running and that Tony Nisbet, who missed only one match last year, will be favourite. Next match for me is probably Frazer''s on Tuesday, and then a Spratts match on Friday on Horseshoe at Decoy. I like Horseshoe – good banks and proper margins, not deep ones like the strips, and I’m happy anywhere. Thirteen of us fished this club match in a very strong, cold Southerly wind and I drew 17, with the wind in to me from the left. At the start it was not difficult to fish with four sections of pole, but of course the wind always freshens when the whistle blows at 10 o’clock, so I didn’t expect to go any farther out. Indeed the wind did get up, and I started on top two to the right; I couldn’t fish the margin to the left as it was so windy and the sun glinting on the waves made it impossible. Terry Tribe, to my left on 15, had the same problem. I potted in maggots and hemp, and within minutes I had a 2 lb bream. More bream, from 6 oz to 2 lb, came steadily for the first hour, on maggot bait with a quick look in the near margin not getting a bite. In the middle of the bream a 15 lb mirror caused me many problems, as it was so difficult to control in the wind. Four times it managed to get under the platform, and I could feel the line rasping on something – I assumed it was a barbel. some barbel later, probably on maggot. Amazingly the fish came free each time and eventually, after almost a quarter of an hour, I netted it. Then I started to lose bream – they would slide in towards the net and suddenly come alive and dive away, probably because the wind had loaded the cool water with oxygen. So I changed down to a softer elastic, from 13H down to grey Hydro. This was fine until I hooked another munter carp, which is still travelling South. Suddenly I couldn’t get a bite, and that lasted for an hour. So with two hours gone I had about 40 lb. I went out eventually to four sections, during a lull in the wind, and managed another half-dozen bream, then a couple of 5 lb carp on top two. I changed up to a 2 gr rig four sections out and contacted bream again. After landing three I had to drive up to the toilet (the cancer treatment is fine but has messed about with my waterworks and the adjoining works). When I came back there was another hour with just a small perch on worm (isn’t that always the case whe you have to leave the peg?) I tried a cast on the Method feeder, while I had a cup of Bovril, with no result. Then worm took a couple of bream from the top two line, and I lost another carp on a light elastic. In that wind with the pole tip in the water it was impossible to feel just how far the fish was away from me, and it broke the line at the hook. Me with that 17 lb mirror which took double cat meat. Eventually I simply had to have another look in the margin, about two feet from the edge. I put in some cat meat and, using a special, strong 3gr rig, saw that there were fish there. In the next 20 minutes I hooked four or five, landing two to 4 lb. The ones that came off did so after about five seconds, and I don’t think they were foulhooked. The water must have been quite turbulent in the side as the wind was now really howling, so with just less than 30 minutes left I put on two pieces of cat meat to try to steady the bait. 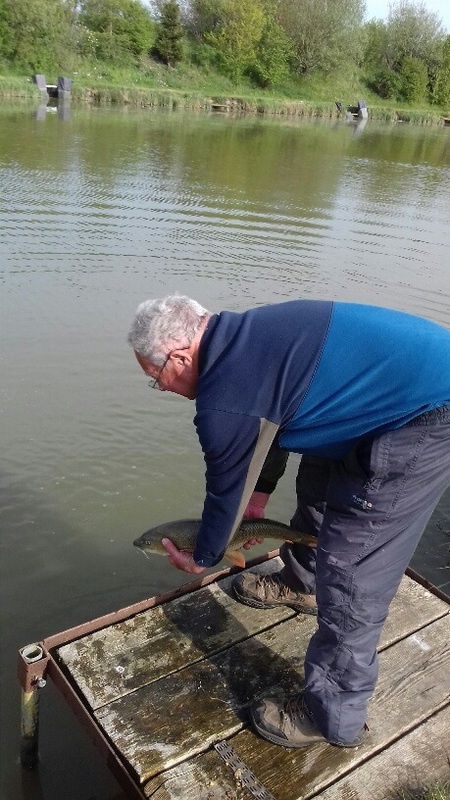 Immediately I had a 6 lb carp, then another huge fish which I played for at least ten minutes...before landing a mirror we eventually weighed at 17 lb – my best-ever. One more five-pounder followed and the match ended, just as I felt I had them lining up. Several of the carp were hooked well inside the mouth – in fact I had to cut the line on the 15-pounder because the hook was so deep. I fancy the fish were picking the bait up, blowing it out and then sucking it back in, as the longer I waited after getting an initial bite the more likely I was to hook the fish. finished 4th with 68 lb 2 oz. bottom. You can't get the staff nowadays! I saw he had several barbel, probably from the margin swim and he also said he fished about two feet from the edge. I didn’t get any barbel, though, perhaps because I didn’t put maggot into that swim – just corn and cat meat. John Garner won with 110 lb 11 oz from peg 6, getting most of his fish also in the side. 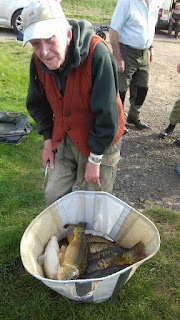 Several anglers took all, or most, of their fish on feeder, including 91-year-old Ted Lloyd with 53 lb 12 oz from peg 3. 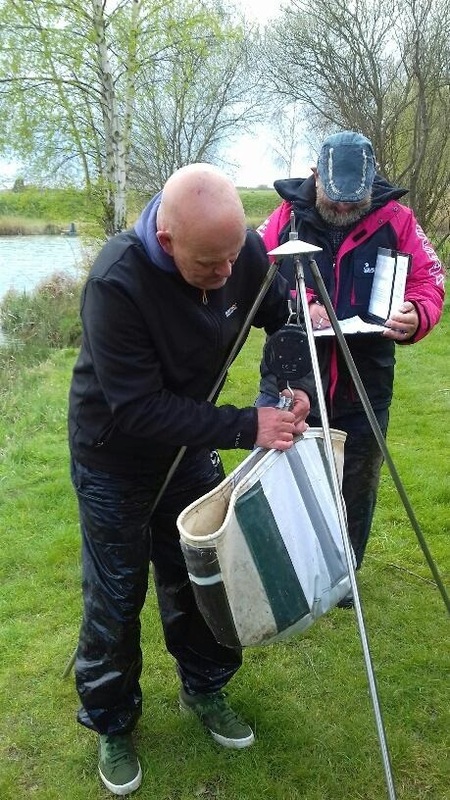 Although I used to fish the bomb almost exclusively on the Fen Drains, I now have more confidence in the pole, even though I go to every match prepared to feeder if I have to. 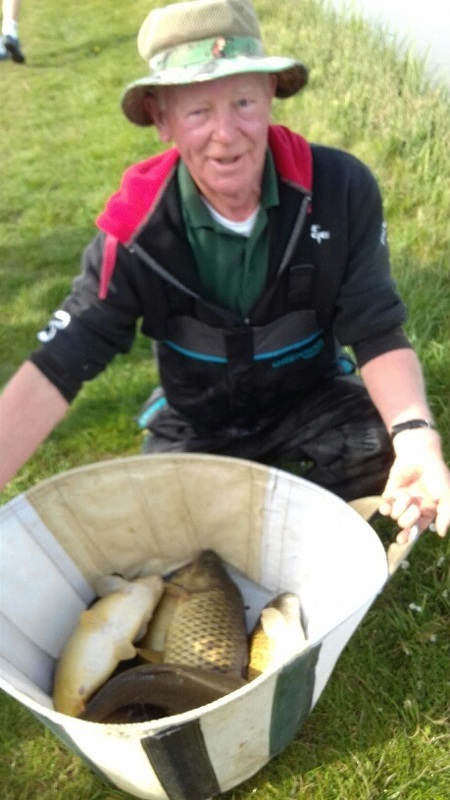 I was pleased with the match I fished, and if every fish had stuck I would have won easily, but it’s difficult gearing up for bream and double-figure carp using the same elastic. I must have changed tops four times during that match. Still, I would have bet against my coming second before the start, so I’m a happy Easter Bunny. Next match Sunday on Elm, and I am leaning towards putting lots of maggots in the margin at the start to attract the barbel, hoping the bigger carp come in eventually. The forecast was for rain and wind, and unfortunately they got it right! Fifteen of us turned out for this Pensioners match, and I drew peg 10 on Emily’s Lake, which was the same peg I won from about six weeks ago, when the weather was much better. Long pole right over, with maggot off bottom, saw some small rudd, and as I had no bread with me I changed to pellet, which resulted in just one more small rudd. I remembered that last time I had caught gppd fish close in to my right, so put some small pieces of luncheon meat there; within minutes the wind got up and the rain started, coming from the right, into my face. Within half an hour I was so cold I gave up fishing to the right, and I hadn’t caught anything there anyway. From that moment I started fishing mainly in front of me, at just over top two length, in between four and five feet of water, where I had put in some maggots and pellets. Frazer had told me to fish the edge of the margin shelf, so I did. 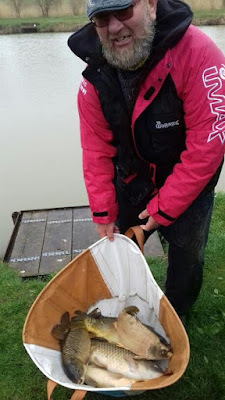 But in the whole of the rest of the match, though I eventually started getting timid bites, I managed to hook just six carp on pellet, and lost two of them, one of which was definitely foulhooked. A look in the deep water farther out produced a couple of tiny bites, almost certainly from carp and not roach or rudd, but no fish. The rain started less than an hour after we started, and continued for four hours, hard at times, and stopping with an hour to go. But at one point I was shivering really hard, even with an umbrella up – and the angler on 12 said he was, also. The sun came out as we packed up! 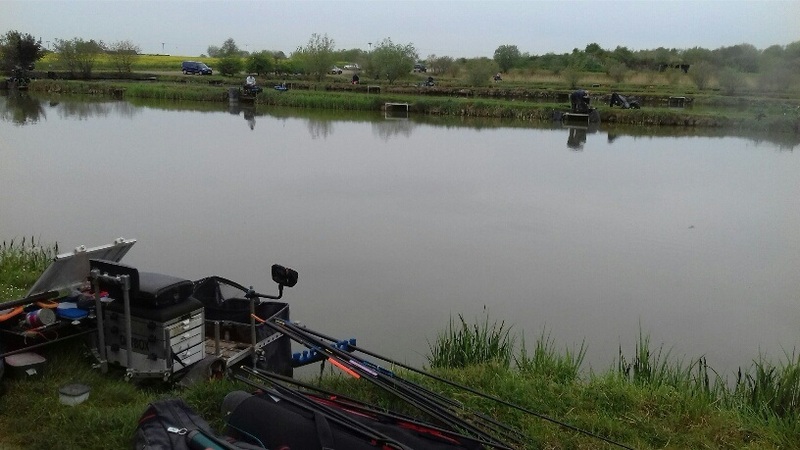 That angler on my left on peg 12 had had two fish across, early on, and then caught on four sections in the deep water on pellet, while Frazer and Robert Edmondson, past him, had caught slowly but steadily most of the day. Robert won the lake with 51 lb 12 oz and I was a measly sixth on the lake with 11 lb 14 oz, the best fish a lovely gold common of 4 lb. Perhaps I should have taken bread, as some fish were caught on it, but I hadn’t realised the weather would be so cold. 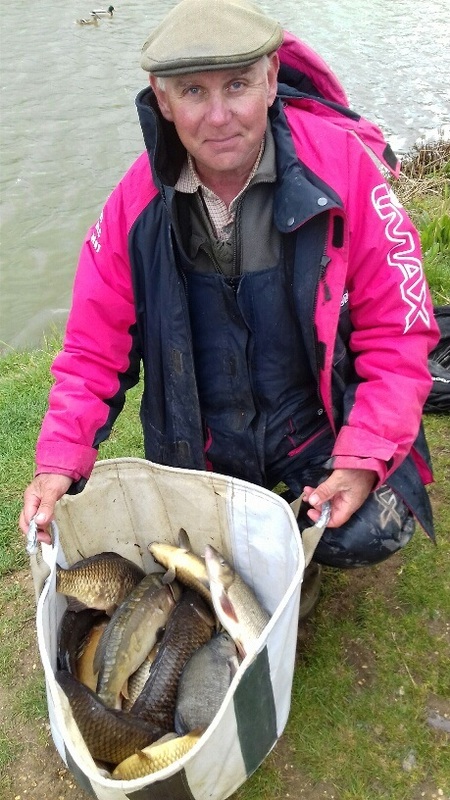 Mark’s Lake produced similar weights, with pegs 2, 3 and 10 dominating, as expected. As with any water, I will have to learn by my mistakes; but I look forward to going again. The fish are not big, but it's a challenging water, the anglers are very welcoming, and the platforms are brilliant. 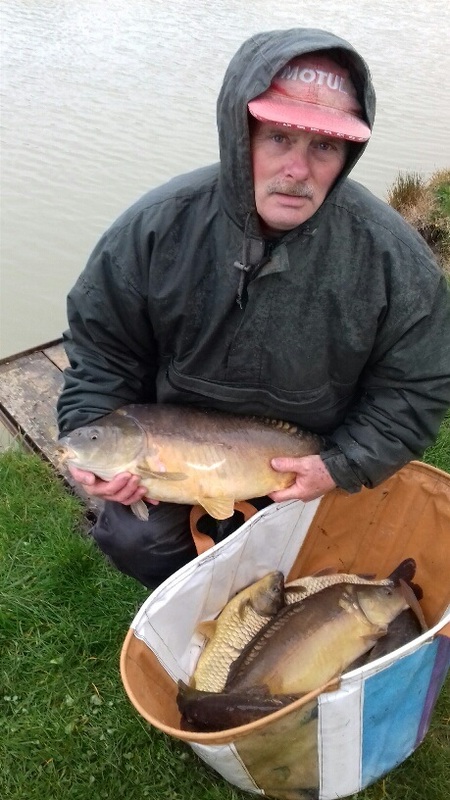 Left:A drenched Paul Firman, third on Mark's with 30 lb 6 oz from Peg 10, shows the sort of fish you catch at Frazer's, mainly to 2 lb to 4 lb, with some larger ones. 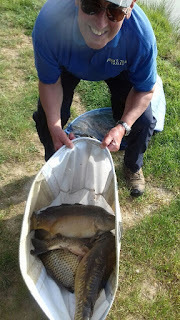 There are also chub (I've had them to 3 lb), plus barbel and tench. 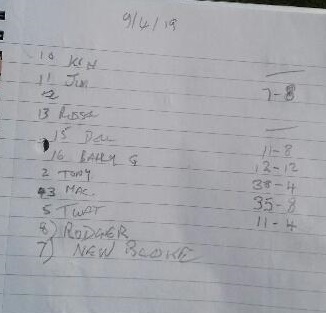 Just eight of us turned up to fish the Sunday Open, with about 15 of the regulars either at Whiteacres or fishing the Match This qualifier at the Glebe. I drew peg 30 – a swim with a very good reputation, in fact I was told that a huge weight came there recently, by an angler who fished a top two in the little bay to the left of the platform. That was my undoing! I started on The Method cast about a third of the way to the island. The North-Easterly wind was quite fierce and blowing in to me from the right, and I decided that any fish were likely to be fairly close so after 15 minutes without a take or liner I changed to pole with maggot over maggot, pellet and hemp just to the right, where the water is deep right against the bank, and immediately started to catch bream around 2 lb. I also put some corn out at four sections in front of me, which was as far as I could comfortably fish, and even then I had to rest the pole on my spray bar. After 50 minutes, with 25 lb in the net I had a quick look out on the longer line, and a 3 lb tench obliged on the first drop-in. But with no more takes in the next ten minutes I went back to the right margin. Things were slow, so instead of working the swim back up I had a look with cat meat in the bay, hoping for big fish. 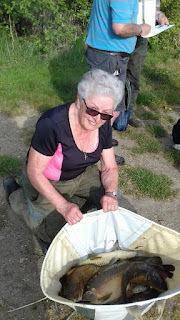 However, although I knew that there were carp there, because of liners, all I had in the next 30 minutes was one bream. So I went to the far corner of the bay with corn, and immediately caught about seven F1s. Then they went off and I wasted a lot more time with cat meat in the bay. With two hours left I still had only about 60 lb, so I went back to the right margin. In retrospect I should have stayed there earlier, with another rig for the shallow part of the swim, over to the right, and another for farther out, to target the fish when they backed off. And then I should have kept feeding the F1 swim to my left. But I kept trying the bay, with absolutely nothing to show for it. I’ve had big carp there before and could not believe I couldn’t catch them again. Although a decent carp or two came in, plus some late barbel, all from the right margin, I finished with 92 lb 15 oz...and I was more than 7 lb over in one net. So actually I had caught 100 lb-plus. 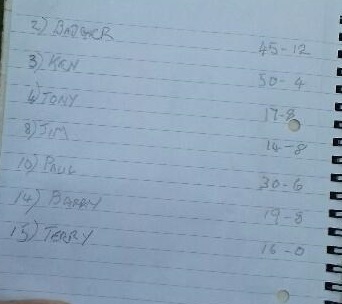 I ended fifth of the eight, won with 165 lb on peg 22. But I forget to take my mobile with me, so I don’t have even a picture of the result. I believe I could certainly have been at least second (136 lb) if I had followed the golden rule – keep putting fish in the net! 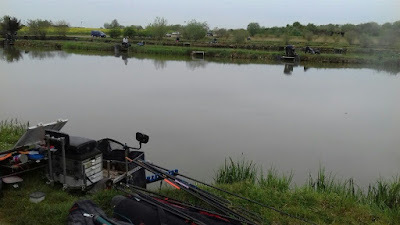 Next match probably Tuesday at Frazer’s, Ely, then it’s Decoy again on Thursday in a club match on Beastie. Born 1942, fished first National on the Gloucester Canal in 1961, and several more until I went to work for various angling magazines in 1979, when my National appearances were severely curtailed. 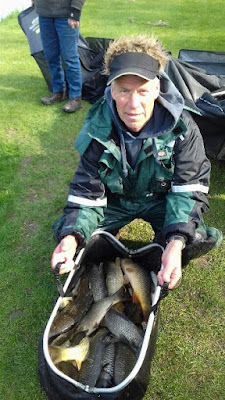 Fished the East Midland Winter League from its inception around 1958 for 30 years. Now I fish only commercials because of the ease of access. Main fishery is Decoy, in Cambridgeshire. 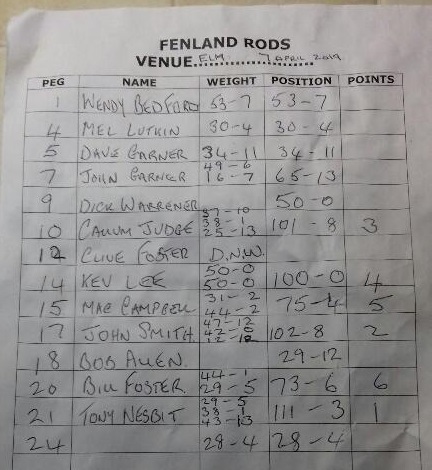 Best match weight 175 lb, though I once caught over 200 lb on Head Fen, Ely, only for two nets to be disqualified! Dozens of 100 lb-plus weights. Most memorable matches: Getting to the first Woodbine Final on Coombe Abbey Lake; winning East Anglian Winter Leage Championship (now defunct); winning section in the Sealink Classic; third in section in Trent National; seventh in this year's Vets National. Now I fish mainly club matches, and occasional Opens. Once held the Middle Level System match record with 98 lb 6 oz in a four-hour match on the Twenty Foot Drain. UPDATE: Best weight now 212 lb on Kingsland Small Carp Lake, 2018.